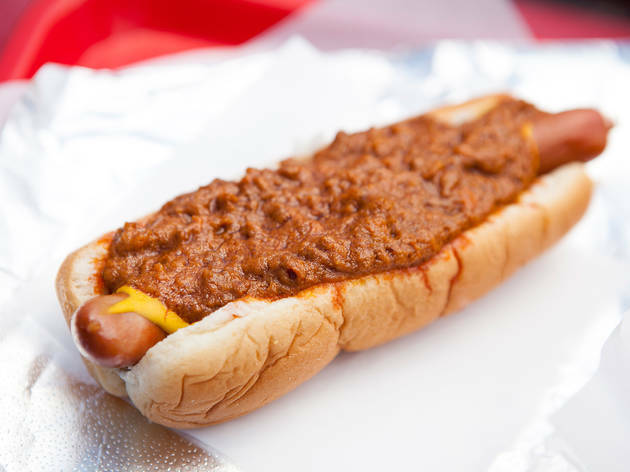 You can argue over LA's best hot dog, but Pink's is certainly the city's most famous. The stand, open since 1939, most notably serves up hot dogs named after local legends and Hollywood heroes, from the Huell Howser Dog to The Brando Dog. 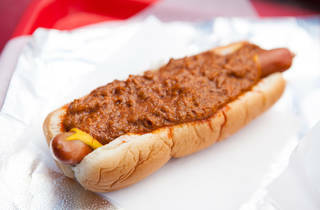 But it made its name with a chili dog, a simple dog smothered in chili, onions, cheese and mustard. Prepare for a long line stocked with tourists by day and clubgoers at night. At first, this place looks like another ol' fast food joint. It isn't!. I mean the food is fast yes, but boy does it taste so much better! Heard that these were the best hotdogs in California (and I don't even really like hotdogs that much). There were so many options! They all sounded good! We ended up settling on the Ozzy Spicy dog and it was gooooood. All of their add ons really work together to elevate the hot dog. And the hot dog itself tasted much better than all the other hotdogs I've had. Really flavorful. We weren't alone in our thoughts because they had WALLS of celebrities that have visited them. Go get one! Still surprised that this place gets such crazy lines and is such a tourist institution. But if people like it, who am I to judge? The hot dogs are definitely very tasty and the fact that it has been around since the 30s is pretty darn cool after all. If you're from out of town and planning to stop by, see if you can find some down hours outside of their usual craziness near mealtimes and on weekends. As you'd expect, the line is usually pretty massive, but I've driven by many times at odd hours and see it pretty short. Pink’s Hot Dogs is a blast. In the 4 days I spent in Los Angeles, it was the only thing I deemed worthy of doing twice. The line is a little rough, but don’t be turned off. The crowd is a fun sampling of locals and tourists alike. My first trip here came after a long day of touristy sightseeing and revived my enthusiasm for the city with a taste of LA’s more down to earth, funky, not to mention, delicious, side. There is seating available out back. Get the Millenium Dog with bacon. And then get it again. And again.